Former UKIP leader Nigel Farage is to meet the EU's chief Brexit negotiator in Brussels next Monday. He wrote to Michel Barnier in October to request a meeting, the day after Mr Barnier met three high-profile pro-EU politicians from the UK. Mr Farage said Mr Barnier was listening to people "who want to stop or delay Brexit" while he would represent the 17.4 million who voted for it. The two men will meet on Monday at the European Commission headquarters. The MEP confirmed he had "finally got my meeting with Monsieur Barnier" in a video on Twitter, in which he asked his followers to send in their questions for Mr Barnier and said he would pick the best three. Mr Farage, who has campaigned for 20 years to take the UK out of the EU, wrote to Mr Barnier after the Brexit negotiator received a visit from Tory MP Ken Clarke, former Deputy Prime Minister Nick Clegg and Labour former minister Lord Adonis in October. Mr Clegg had told reporters the three were there to "get a better understanding" about what was going on in the negotiations - asked if they were there to stop Brexit he replied: "If only it were that easy." The European Commission said at the time that Mr Barnier's "door was "always open" but added: "There are two negotiators - on the one side the Secretary of State for Exiting the EU, David Davis, and on the European side it's the chief negotiator of the EU, Michel Barnier. Nobody else." 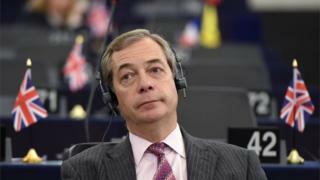 James McGrory of the pro-EU Open Britain group suggested that Mr Farage going to Brussels was "like sending an arsonist to put out a house fire". "He has no answers to the costs and complexity of Brexit, other than to blithely say we should walk away with no deal, which would be an unmitigated disaster for our economy and our country," he said.